The Calgary Stampede is known as the greatest outdoor show on earth: a ten-day “whoop-up” of non-stop rodeo, chuck wagon races, country music, carnivals and more. Celebrate the city’s western heritage in style and then set out to explore the colossal scale and drama of the Rockies, less than two hours away. 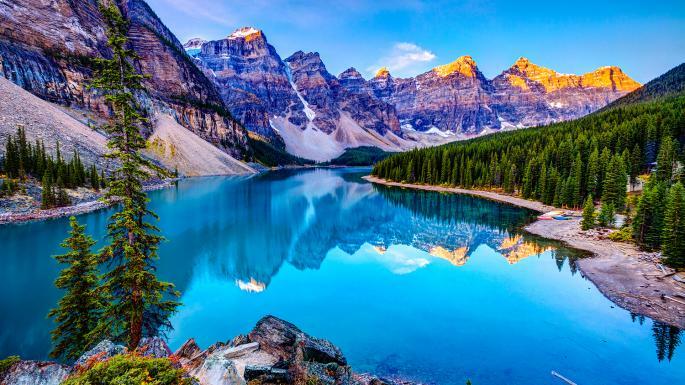 Highlights include the snow-capped mountains of Banff National Park, the turquoise waters of Lake Louise and Moraine Lake, and the 143-mile Icefields Parkway, one of the most beautiful drives in the world. Forget viewing the Niagara Falls at the designated viewing area, crammed with selfie-stick wielding tourists. 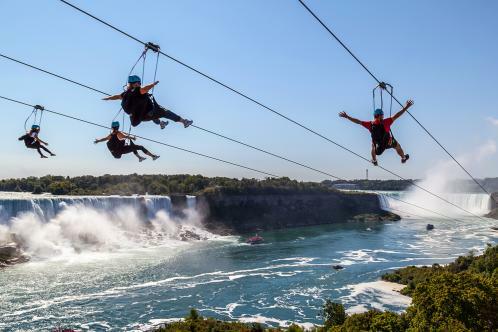 Instead, hurtle towards the thundering waters at 40mph on the new zip wire, with three other people on parallel lines, strung from the top of a concrete viewing tower. The 670m zip wire takes 50 seconds and provides a mighty adrenaline rush. 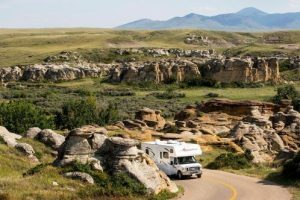 Celebrate Canada’s 150-year anniversary this summer with a ten-night self-drive camper van tour around the country’s capital province, Ontario. 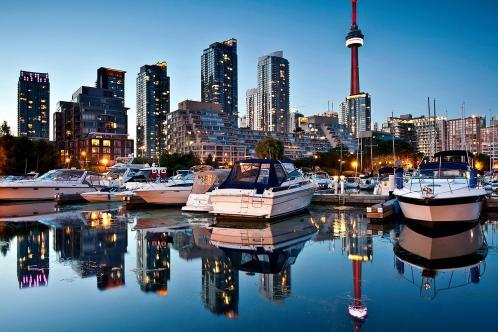 Starting in Toronto, the Classic Ontario Circle route takes in the Niagara Falls, the crystal clear waters of Georgian Bay, including Wasaga Beach, and Algonquin Provincial Park, filled with maple hills and quiet meandering rivers that are perfect for canoeing. Finish with two days in the capital, Ottawa. Muskoka, Ontario’s cottage country, is Toronto’s version of the New York Hamptons — an exclusive summer hideaway, two hours north of the city, frequented by Cindy Crawford, Tom Hanks and Steven Spielberg. The 2,500-square mile region of lakes and woodlands is down-to-earth, peaceful and populated by more loons (Ontario’s provincial bird) than people. Book a cottage on the water’s edge, take a boat out fishing or explore nearby towns. New England may be North America’s best leaf-peeping destination, but in Ontario the colours are arguably as spectacular and the crowds a fraction of the size. This new group trip combines hikes among the autumn hues of Lake Superior — the largest freshwater lake in the world — with a two-day excursion in a traditional Voyageur canoe, exploring the waterways of the Rossport Islands. 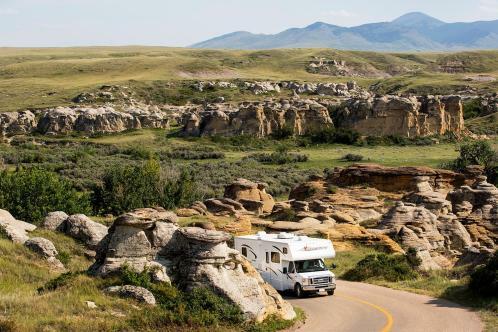 This new camper van road trip from Trailfinders explores the lesser-known landscapes of one of Canada’s most popular provinces, Alberta. Highlights include: Dinosaur Provincial Park, home to the largest collection of dinosaur fossils anywhere in the world; the stunning prairies and peaks of Waterton Lakes National Park, one of the Canadian Rockies’ best-kept secrets; and the friendly mountain town of Canmore, with rafting, hiking, biking in the Kananaskis range. Baseboarding is the newest winter thrill to hit North America this season and Whistler Blackcomb, Canada’s premier ski destination, is the only place to try it. A combination of skeleton bobsleigh and bodyboarding on snow, it involves riders going headfirst down the mountain on a kind of high-speed, highly manoeuvrable tea tray. It’s easy to pick up, great for families and no experience is required. This year the resort’s beginner ski terrain has been expanded and there are 8,000-plus acres and more than 200 pristine trails to enjoy. To commemorate Canada’s 150th anniversary this year, all fees for national parks have been waived. See three of the best, as well as much of the west coast’s spectacular scenery, on this new Lakes & Lodges self-drive trip. Beginning on the Pacific coast, in the hip metropolis of Vancouver, the route follows the Sea-to-Sky Highway to Whistler — one of the country’s most scenic drives — before heading deep into the jagged peaks of the Rockies and three of its most breathtakingly beautiful national parks: Yoho, Jasper and Banff. Stay in luxury mountain and lakeside lodges. This year marks the long-awaited completion of Canada’s Great Trail, the longest connected network of footpaths in the world, stretching 14,864 miles from the Atlantic Ocean to the far north of the Yukon. Discover one of its most spectacular — and lesser-known — sections on a self-guided cycling holiday through the orchards and vine-covered hills of the Okanagan Valley, Canada’s premier wine-producing area. With no more than 30 miles of gentle pedalling a day, and comfortable B&B stays each night, the trip has plenty of time for leisurely lunches. Combine a break in Vancouver, one of Canada’s most vibrant and naturally beautiful cities, with three nights of adventure at the new rustic luxury Farewell Harbour Lodge. On the edge of the Great Bear Rainforest, one of the last stretches of untouched coastal temperate forest in the world, and accessed only by float plane, this remote waterfront retreat, with wraparound decks, a hot tub and private ten-acre forest, offers the chance to see grizzlies in the wild, kayak with killer whales, or just curl up and watch the sun set over the misty fjords. It’s the perfect complement to Vancouver’s bustling cultural scene. Explore the history and stunning landscapes of the Pacific coast on a new small-ship cruise designed to mark the 150th anniversary of the country. Sailing in classic wooden schooners or converted tugboats, with naturalist and historian guides, the trip charts rarely visited waters through the Gulf Islands of the Salish Sea, stopping at historic sites to tell the story of the west coast’s early settlers and indigenous population. It is timed to coincide with British Columbia’s peak wildflower and wildlife season. There are just four simple guest rooms on board. The Haida Gwaii archipelago, 100 miles off the north coast of British Columbia, is known as Canada’s Galapagos for its abundance of wildlife. See it best on a new small-ship cruise designed to take you to its most spectacular parts. Daily shore excursions offer exceptional wildlife viewing, including the chance to see Gwaii Haanas black bears, the largest black bears in the world, as well as hikes through ancient rainforests. Kayak among humpback whales, orcas and dolphins. There is only one way to arrive at this floating lodge in the heart of the Great Bear Rainforest — by seaplane. The winters here are harsh, and linger, so arrive in early summer when the melting snow reveals new growth and the hungry grizzly bears come out of hibernation. Spend days hiking in the rainforest or fishing, before relaxing at the lodge with a drink by the water. Take in the sights of Vancouver before flying north to the lodge. Heli-hiking is to traditional trekking what private jets are to budget airlines — same activity but more style. This adventure transports guests by helicopter to a new, otherwise inaccessible mountain peak each morning. No trails, no other people, just you and great views. Base camp, at the beautiful boutique Bugaboo Lodge, surrounded by Alpine glaciers and steep forested peaks, is almost as good, with gourmet food and a fabulous night sky to survey from the rooftop hot tub every night. 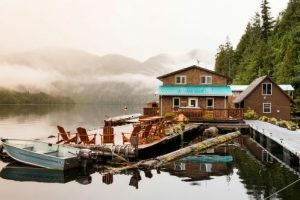 Experience true Canadian hospitality on a self-drive B&B road trip around the west coast’s undiscovered small towns. Starting in Vancouver, the circular route explores the fresh seafood and artist galleries of Salt Spring Island before heading to the seaside towns of Sooke, Ucluelet and Quadra Island for quiet beaches, leisurely walks and stunning sunsets. Stay in small guesthouses, with three or so hours’ driving every few days. 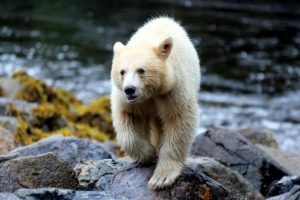 According to Native American legend, the elusive, all-white spirit bear would lead the lucky few who spotted it to magical places. The legends may be right; its home, in the Great Bear Rainforest of the Pacific coast, is magic indeed, teeming with wolves, grizzlies and enormous cedars draped in moss and mist. See it best at Spirit Bear Lodge, a rustic luxury retreat in the heart of the rainforest, which has a four days’ walking and river safari led by native Kitasoo guides whose intimate knowledge provides the best chances of seeing the creatures first-hand. See grizzlies in the wild without breaking the bank at Bear Camp, on the edge of the Chilko River — one of the best places in the country to witness the annual salmon run. It’s based in comfortable safari-style tents, perched high over the river on an interconnected network of elevated walkways and platforms; watch one of nature’s greatest spectacles from the comfort of your own private deck. Other adventures include kayaking the crystal clear waters of Chilko Lake, hiking through wild and untouched forests and some of the best white-water rafting in the country. The Alaska Highway, which runs 1,422-miles from the northern tip of British Columbia through the Yukon and into Alaska, was one of the most challenging engineering projects of its time. Celebrate its 75th anniversary this year by driving some of its most scenic sections on a 4×4 road trip, which takes in two of the Yukon’s other classic drives: the Dempster Highway, across the Arctic Circle, and the breathtaking Top of the World Highway, along the high mountain ridges north of Dawson City. Hike the Tombstone mountain peaks, see the glaciers of Kluane National Park and follow in the footsteps of Canada’s gold rush pioneers — all under the surreal glare of the midnight sun. Travel back to the early days of Canadian exploration on a nine-night group dog-sledding adventure across the Yukon. The trip begins with four nights at the Sky High Wilderness Ranch, just outside the frontier town of Whitehorse, mastering the basics of mushing, and returning each night to hot saunas, home-cooked meals and cosy fires. Then head out with your huskies into the wilderness for three nights’ winter camping in comfortable tented cabins with cot beds and wood-burning stoves. Miles away from the artificial lights of civilisation, there is an excellent chance of seeing the northern lights. This new cruise through the vast Arctic floes of the Northwest Passage offers the first public viewing of the HMS Erebus, the explorer Sir John Franklin’s wrecked vessel from his doomed 1845 expedition. You will be cruising in comfort, with barbecues on deck, a swimming pool, sauna and even a hot tub. 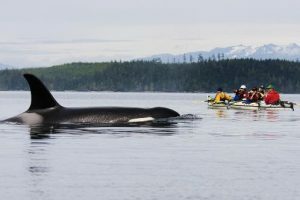 Highlights include shore expeditions to three of Canada’s most remote national parks, visits to indigenous communities and the chance to snorkel above the wreck. Canada’s caribou migration is one of the most remarkable journeys in the animal kingdom. Twice a year — in spring and autumn — herds half a million strong travel hundreds of miles between their winter ranges in the Yukon and their calving grounds on the Alaskan coast. See the spectacle from the remote Arctic Haven Wilderness Lodge, a boutique retreat on the shores of Ennadai Lake, in Nunavut — 500 miles from the nearest town. Enjoy helicopter safaris, the chance to walk with the herd and world-class fishing on your doorstep, with roaring fires and gourmet dinners. If you want to see these great white beasts, but don’t fancy getting your toes cold, this new trip from Western & Oriental is the one for you. Based near the remote town of Churchill, in northern Manitoba — one of the few places where polar bears can be seen easily in the wild — intrepid travellers will make daily adventures that include tracking polar bears on foot and snorkelling with Beluga whales. Stay at the five-star Seal River Heritage Lodge, recently included in National Geographic’s Unique Lodges of the World collection for its green design and thrilling wildlife experiences. 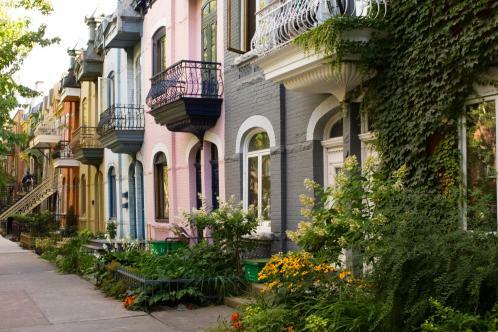 This fun, foodie city on Canada’s east coast is the perfect combination of French style and North American spirit. During the Prohibition era Montreal was known as the city “where the booze flows and anything goes” and it’s been living up to that reputation since, especially in summer when bars and restaurants take over the streets and festivals fill the air with music and colour. This year will be particularly special because the city is celebrating its 375th birthday, with hundreds of events and festivities planned. At the northeast corner of Newfoundland, on the edge of the Atlantic Ocean, is Fogo Island Inn: one of the boldest design hotels conceived. Perched on stilts by the water’s edge, with floor-to-ceiling windows looking out to sea, and rooftop hot tubs, this contemporary take on Newfoundland outport design is as radically beautiful as its surroundings are wild and sublime. Explore the island’s community and traditional fishing hamlets, take punts out to passing icebergs, forage for berries or go in search of caribou. Most of all, slow down, curl up and listen to the crash of the Atlantic and the soft whistling of the sea. 25 Nova Scotia cruise This new trip from Wildfoot Travel is remote, small-ship expedition cruising at its best. Beginning in Nova Scotia, the route travels steadily north up the coast, past old Viking settlements and the spectacular fjords of Gros Morne National Park, to the Arctic waters of Nunavut, where polar bears and walruses prowl the ice. The cruise stops at the towering wilderness of the Torngat Mountains, Canada’s newest national park, considered to be a sacred “place of spirits” among the Inuit, who still hunt and fish these waters. See the best of Canada’s spectacular Atlantic coast on this new fly-drive holiday from Best Served. Highlights include: exploring Nova Scotia’s self-drive Seafood Trail, which links the island’s best ocean restaurants; experiencing the Bay of Fundy’s world-record high tides, rising to a peak of 50ft twice a day; and driving the legendary Cabot Trail, through the remote fishing villages and wild coastline of Cape Breton, one of the most scenic — and beloved — road trips in the country. Skiing transatlantic can be cripplingly expensive, but for all the bragging rights without the price tag Tremblant is a safe bet. With its snow-sure slopes and magnificent views, the Quebec resort is also the cheapest North American destination in Crystal Ski’s brochure. Expect to be munching on caribou and poutine, and wrapping up warm — temperatures plummet to minus 40 in the height of winter. One hundred and fifty years ago elected officials met on Prince Edward Island, off the Atlantic coast of New Brunswick, to discuss the founding of a new country — an event that led to the birth of Canada. This summer, celebrate the country’s sesquicentennial and explore one of its most historic regions, on a seven-night trip taking in the best of the island. With stays in historic boutique hotels, including the beautiful Dalvay by the Sea, this is a getaway with beautiful beaches, scenic-drives and candle-lit seafood dinners. The route of the Rocky Mountaineer train is one of the most spectacular in the world. The historic “First Passage to the West” is a two-day journey through the heart of the Rockies, from Banff National Park to Vancouver. 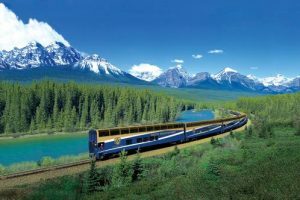 Add three nights aboard the Canadian, a luxury sleeper train, travelling west from Toronto to Jasper National Park. From the French-speaking east to the soaring peaks of the west, experience the entire country, five of its best cities and many must-see sights in one whirlwind trip. Highlights include Niagara Falls, Ottawa and Montreal in the east, before flying west to Calgary and the Rocky Mountain towns of Banff and Whistler. The trip finishes in Vancouver.